Hello. 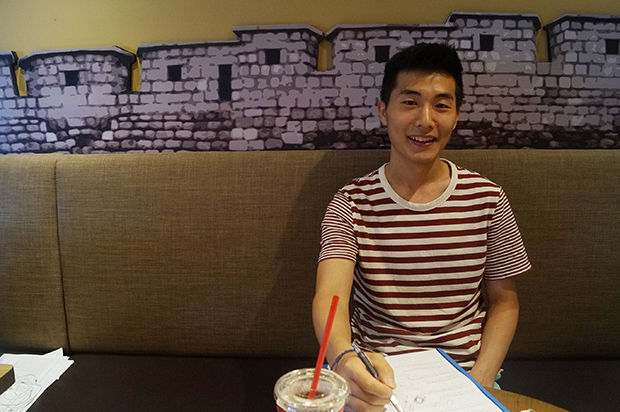 I am Dong-hyeon Kim, a member of class 2010 majoring in Computer Science in the College of Electrical Engineering and Computer Science of Kookmin University. With a clear idea of service that I had been interested in, I planned a project called ‘Addvolun’ and take charge of the overall project promotion in this group. I happened to participate in service activity during the summer vacation with my friends and at that time, I wanted such opportunity to be more meaningful. Then, some ideas came up and we planned to develop the project by reaching out to other friends to practice service activities. 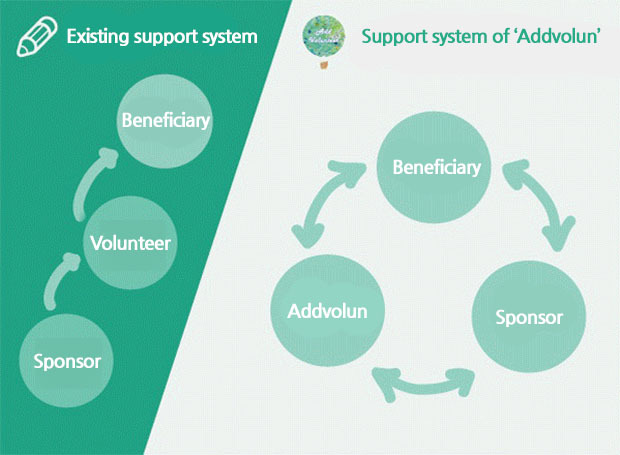 Volunteers of ‘Addvolun’ provide various services related to their field of expertise. 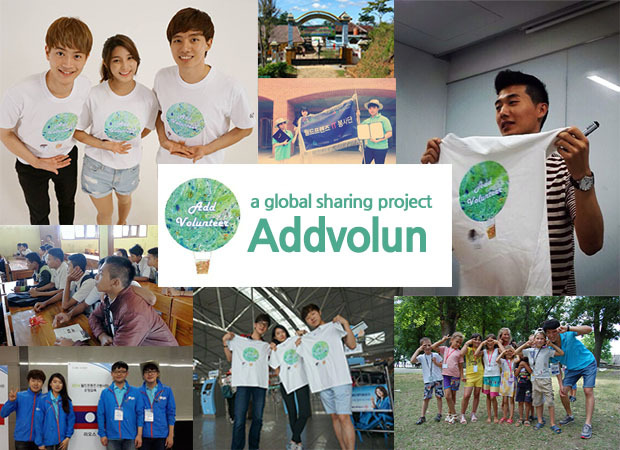 The name ‘Addvolun’ is a compound word of ‘add’ and ‘volunteer’ meaning ‘to add volunteer/service.’ The projects started from a question, ‘where the money I donated is used’ Our group that is composed of 38 people directly delivered designed T-shirts and school supplies to the children suffering from the hardships of life in Laos, Cambodia, Uzbekistan, Mongolia, Moldova, and Indonesia by receiving donations in use of social funding. Our activities are shared in real-time through the ‘Addvolun’ page of Facebook to inform about the site as well as the moments of sharing. The rate of the first social funding that was progressed for 2 weeks was 117% and it was successfully concluded. Now, we are promoting the second social funding. Since I had been interested in service and volunteering, I thought that service was possible if I have money. So I vaguely thought to earn a lot of money. One day, I was very moved by a news article about a mother who supported her daughter after she became a human vegetable all of a sudden. At that time, I was in the military so there was no savings. 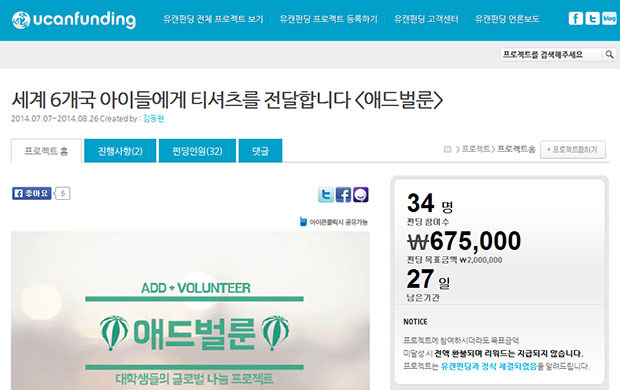 From then on, I saved my salary and after completing my military duty, I informed the journalist who wrote the article to donate the money to the mother and daughter. Of course, I expected positive and delighted response but as this article caused quite a stir throughout the society, many businesses wanted to use the mother and daughter commercially. Eventually, they refused any kind of help. With this incident, I realized that money was not everything for service/volunteer and doing what I could up to the point the service-receiver wanted was the true service. Since then, I have practiced volunteer/services in use of my major and making good use of available opportunities, I was able to promote this project. In general, a supporting group helps after receiving donation from a donor. Since donors do not directly help by visiting people in need in overseas countries, it is impossible to know where my donated money is used and directly see what kind of service is provided using my contribution. However with ‘Addvolun,’ it is possible to know where the donated money is used as well as when, where, to whom, and how the money is delivered by seeing the video. Donors can feel the sense of sharing. What is the reason of selecting such system? Some people have money but cannot directly deliver whereas others can deliver anything although they do not have money. In consideration of both situations, we become a linked-ring between the above-mentioned people and service-receivers. With the money from those who cannot directly deliver, those who can deliver brings the things needed by the service-receivers and by showing such activities to all donors, we create interaction among donors, volunteers of ‘Addvolun,’ and service-receivers. The donors are happy to see the site of sharing through video and the volunteers are happy to deliver the things needed by the service-receivers. Also, service-receivers are happy to be supported. Likewise, it is the cycle of appreciation and by delivering folk crafts or letters from the service-receivers to the donors, we can create an additional contact point within the project. It is possible to make contribution for ‘Addvolun’ through social funding. Explain the schedule for this activity. 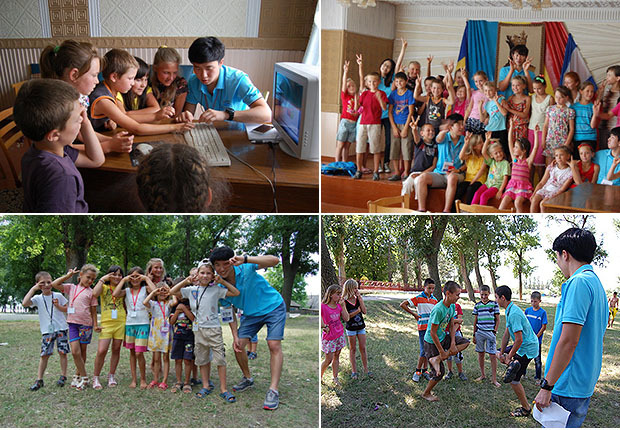 Every team except for our team brings T-shirts and promotes service activities in each country. In case of the donation collected by the first social funding, we delivered the school supplies purchased with the donation and filmed the delivery video. Currently, the second social funding is being progressed. Once the social-funded donation is delivered, the directly-designed T-shirts are delivered to the donors and service-receiving children. I will also visit Uzbekistan with my team members on July 29th and deliver school supplies and T-shirts. After my departure, the three team members in Korea will send us the list of donors in real-time and the volunteers of each country receive it to promote service activities. Do you have an ultimate goal through such activities? What I expect is the culture of sharing. I hope that people will start to think that helping or donating for others is not that difficult or complicated as it may seem. It can be grandiose but at the same time, it doesn’t have to be grandiose. For example, helping can be in the form of establishing a school or necessary facility for a country in need. But if we save money for a cup of coffee today, it is possible to donate necessary clothes or school supplies to poor children. There are things we can do for our fellowmen in various forms other than money. It is redirecting what we think in terms of helping and serving others. Simply put, I want such easy sharing culture to spread in the society. You are about to leave for a volunteer service. How do you feel? I am the last to leave for the service activity. We have about a month until the end of the social funding; however, the fund is still insufficient. Also, I am sorry not to being able to let more people know about what we do through more promotional activities before leaving for Uzbekistan. So I am little anxious. On the other hand, I am excited and happy to directly deliver the school supplies and T-shirts that were designed by our team members. I hope this project will continue towards the positive direction and I believe that everything will be fine as we hope it would be. Also, I thank those who helped this project. I express my heartfelt appreciation to those who followed and promoted the project with belief in me so I will make more efforts for the members of the projects. Lastly, give a comment to Kookmin*People. As we received precious money from others, we will film the video at the moments of sharing. In doing so, it will reward the donors and fulfill the purpose of our project. Thus, I feel the sense of duty. I think it is not difficult to help others. There is no boundary when it comes to service/volunteer. It is more meaningful if we can help others with what we can do. Besides volunteering, it is good to start immediately if you want to do. Nothing can be achieved without acting and we would never know what will come next without making a step forward. Since we are still young to fear for a failure, I advise you to think over what you want and act towards it. After the interview, I asked why he wanted to keep promoting this project as there was no benefit from it regardless of his efforts and time. He said that many people asked the same question but all he answered was that he just liked doing something for others and he feels happy when sharing. He wanted to produce 200 T-shirts with his money and help his team members in overseas countries as soon as possible. Seeing the excitement from his face, service is not just mere sympathy to those who are lacking compared to us but it is also the delight to the service-givers. We can buy two cups of coffee with 10 thousand won but it means great happiness when shared. Of course, both are good choices and should be respected. However, I cautiously recommend choosing happiness instead of personal relaxation. Like Dong-hyeon Kim who looks the happiest when sharing, it may warm up your mind. What! Our professors are in the online lecture!